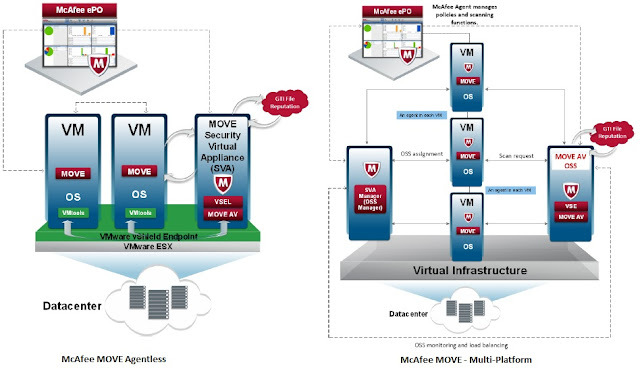 When I was looking McAfee MOVE Anti-Virus solution for one of my customers, I was confused with these variants of McAfee MOVE (McAfee MOVE Agentless and Multi-Platform). After spending a day on research, I got what they are and function of each product. Writing this article for anyone come across the situation where they need to decide which product they need to choose as an Anti-Virus solution as part of the solution design. In recent times, installing agentless Anti-Virus solution for virtual infrastructure (VMware vSphere/ Microsoft Hyper V) become a common practice for virtual desktop and servers to offload virus scan job from virtual machines to a dedicated virtual appliance or offload scan server. 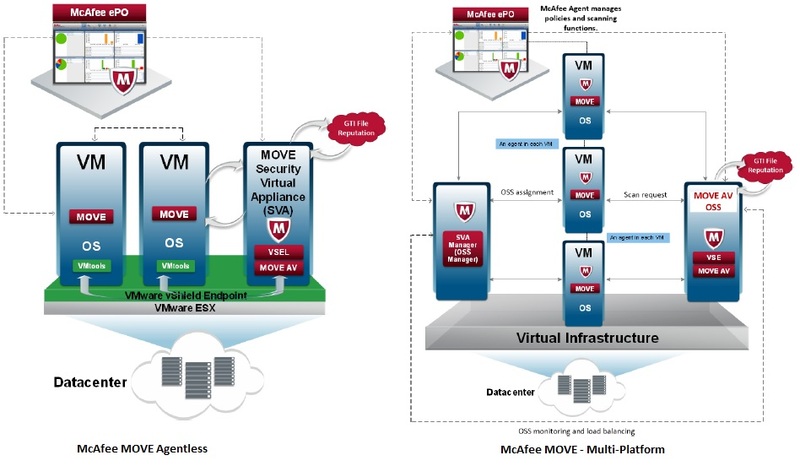 At high level, McAfee MOVE agent solution is aimed for VMware hypervisor which uses vCloud Networking and Security (vCNS/ vShield manager) and it leverages vShield Endpoint Thin Agent installed as part of the VMware tools. Whereas McAfee MOVE multi-platform works with VMware and other well-known virtualisation technologies Hyper-V and XenServer. For detailed instructions to install and configure McAfee MOVE Multi-Platform solution, refer "McAfee MOVE Multi-Platform Install and config steps"
In addition to above high level information, I found following table from McAfee communities. Adding here as I think it helps community. Please feel free to leave your thoughts/ comments or if anything missed. "Thanks for sharing. i really appreciate it that you shared with us such a informative post. Mcafee UK | Mcafee Number"